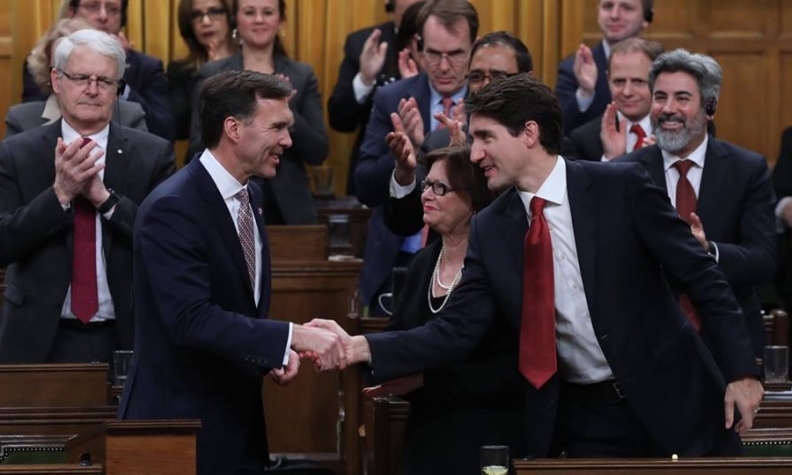 Finance Minister Bill Morneau, left, tabled the Liberal government's 2017 budget on March 22. Canada’s automotive industry got little mention and limited spoils in the 2017 federal budget tabled by Finance Minister Bill Morneau in Ottawa on Thursday. The word “automotive” appears just three times in the 278-page document, which does give a nod to advanced manufacturing. David C. Adams, head of the Global Automakers of Canada, called it “more of a policy document in a lot of ways” than a budget. Adams combed through the budget Wednesday night, preparing notes for his members. They will meet sometime during the week of March 27 to discuss what’s applicable to Canada’s auto industry. “The reality is they probably presented a different budget than they thought they would be presenting given all the uncertainty with the Trump administration and what that might mean,” Adams said. Trump has vowed to renegotiate NAFTA and cut corporate tax rates and he’s hinted at imposing a border tax on imports, all of which could affect the Canadian economy and the auto sector in particular. The biggest automotive item in the 2017 budget is the newly-proposed Strategic Innovation Fund. The government is rolling a number of existing financial support programs, including the Automotive Innovation Fund and Automotive Supplier Innovation Fund, into a single streamlined Strategic Innovation Fund worth $1.26 billion over five years. Ottawa will add $100 million in new money to that pool of money over three years, and another $100 million taken from the 2016 budget. So essentially, it is a $1.26-billion investment that includes only $100 million in new funds that needs to be shared by numerous industries, including aerospace, defence initiatives and tech sectors. “What that means, who knows?” Adams said, noting that a single fund should lessen bureaucracy. Through the current Automotive Innovation Fund, automakers can draw non-repayable grants from a pool of $500 million available through 2021. "Further details on the design and implementation of innovation-related initiatives announced in Budget 2017, including the new Strategic Innovation Fund, will be available in the coming months," the Ministry of Finance said in an email to Automotive News Canada. Adams said automakers were invited to participated in budget consultations and “made minor recommendations,” one of them being support of Ontario’s suggestion to eliminate the HST from purchases of electric and hydrogen vehicles. “That’s something we would support especially given Quebec where we have a zero-emissions vehicle mandate,” Adams said. Starting with the 2018 model year, Quebec will require automakers and dealers to sell a minimum number of electric, plug-in hybrid and hydrogen fuel-cell vehicles. It starts at 3.5 per cent of all auto sales in the province in 2018 and move to 15.5 per cent for 2025 models. Quebec is the only province that has such legislation. Adams said he was “surprised a little bit” that the budget didn’t address EVs or hydrogen vehicles beyond adding to the country’s charging infrastructure. Meanwhile, the head of the Canadian Automotive Parts Manufacturers Association lauded the creation of a small number of business-led innovation “superclusters” that will focus on innovative industries. For example, General Motors opened a new software development centre in Markham in 2016; the University of Waterloo is testing the first autonomous vehicle allowed on provincial roads; and Ottawa recently asked the province to designate it Ontario’s first Centre of Excellence for Autonomous Vehicles. “It’s critical for our guys to compete in the short-term and win the business” when it comes to technology and parts, Volpe said.